The “Day of Dialogue” on Wednesday is an-all day event which will strive to “continue to create and elicit community members to engage, not only in meaningful conversations towards increased inclusivity and equity on campus, but also in initiatives and activities to effect that change we want,” says Day of Dialogue Committee Co-Chairs, Professor Alexis Castor and Professor Jorge Mena-Ali. A major part of the Day is the Keynote Speaker. 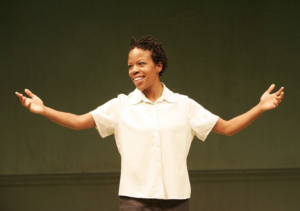 This Day of Dialogue’s is Nilaja Sun Gordon ‘96 who is an “actress and playwright who has used her singular talent to express her humanity, to bring people together, and to raise awareness of critical social issues,” says the College’s webpage on the Day. Gordon is the author of an Obie Award-Winning, one woman performance titled “No Child…” which ran off-Broadway from 2006 to 2007. This performance addresses issues challenged daily within the New York City Public School System including violence and race. Other workshops throughout the day include “Beyond Bumper Stickers and Safety Pins: Be(com)ing an Effective Ally” which will examine and discuss “definition of allyship, the limitations to the social justice work that allies can effectively do, the common pitfalls that allies may fall into in their attempts to effectively work towards social justice and inclusivity, and the various proposed practices to effect appropriate allyship,” according to the session’s description. This session will take place at 3:45 P.M. in LSP 138. Another session titled “Representing Race on Stage” invites and provokes participants to engage critically with the ethics and stakes of race representation in theatrical spaces. The session will be at 2:30 P.M. in Stager 215.